According to the September Spectrem Millionaire Confidence Index (SMICI), more investors with $1 million in investable assets plan to invest in every standard category of investing, from Stocks to Cash to Bonds to Real Estate. Only 23.8 percent of Millionaires do not plan additional investing in the month ahead, and that is the lowest level of non-participation since August of 2015. On the other hand, in the September Spectrem Affluent Investors Confidence Index (SAICI), among those investors with $500,000 or more of investable assets, the intention to invest in Stocks and Stock Mutual Funds dropped, and non-participation climbed back up near 50 percent to 46.5 percent. Among all investors, the only category to see a drop in interest is Stock Mutual Fund investing. However, Cash investing went up 12 percent. Non-participation overall dropped to 32. 8 percent, the lowest percentage since November of 2016. In May of this year, non-Millionaires recorded a higher confidence level than Millionaires for the first time in years. The status has returned to normal since then, and Millionaires express a much higher confidence and intention to invest going forward. It is interesting that Cash investing among Millionaires has reached 30 percent for the first time since October of 2013. Cash investing climbed among 16 points among Millionaires, from the mark of 14.8 percent, the lowest percentage since June of 2014. Among non-Millionaires, there was an increase in Cash and Real Estate investing, an increase in non-participation, and a sizable drop in Stock Mutual Fund investing after a massive increase in September. Here is something rarely recorded in the Spectrem Confidence Index: the women recorded a small increase overall while the Men had a downturn in confidence, especially among the non-Millionaires. The Millionaire Confidence Index for men is 17 and for women it is 11, and the two genders are rarely that close in confidence level. For the men, there was a notable increase in Cash and Bond Mutual Fund investing, while Stock investing increase for women as did Individual Bond, Cash and Bond Mutual Fund investing. In both genders there was an increase in investment participation. The index for both Millionaire and non-Millionaire Republicans dropped significantly in October, down 15 points among the non-Millionaire’s and down 9 points among the Millionaires. There was only a slight drop in the index for Democrats in both wealth segments. Just as there was a dichotomy in the Millionaire vs. non-Millionaire outlook, so was there a significant difference between the way retired and working investors see the next month. The index for both Millionaire and non-Millionaire working investors went up, reaching 22 for Millionaires and 17 for non-Millionaires. The retired investors saw their index numbers drop, to 9 for Millionaires and to 2 for non-Millionaires. 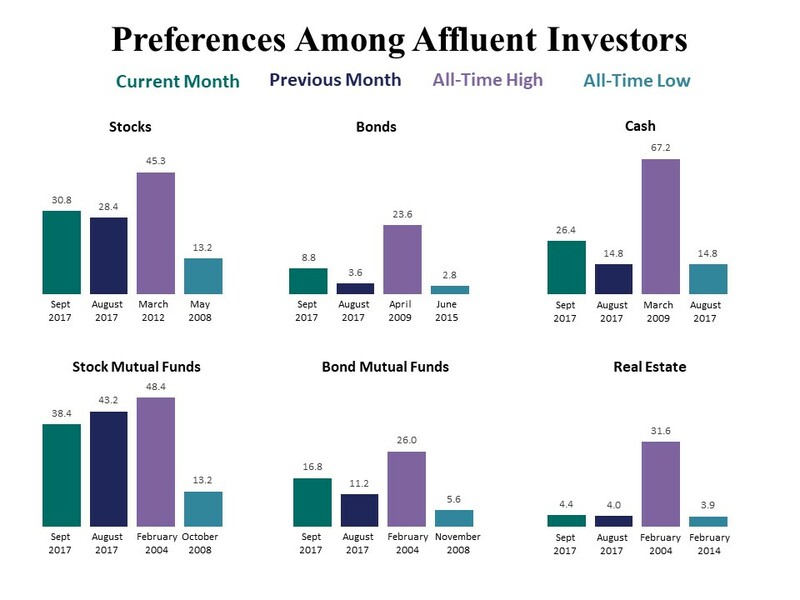 The Millionaires recorded an increased interest in Stock and Stock Mutual Fund investing, while the retired investors increased in the safety categories of Cash and Bond Mutual Fund investing.